A child and an adult leave Farragut Elementary School in St. Louis' Greater Ville neighborhood in January. For more than a decade, the St. Louis Board of Education met every month in a school library, gym or cafeteria across the city with only the most diehard public-education watchers in attendance. Despite keeping up appearances, actual control of the city’s public-school system had been forcibly handed over to another body more than a decade ago. The board has been disenfranchised since a 2007 state takeover of St. Louis Public Schools amid rising deficits, falling academic performance and revolving superintendents. After 12 years of oversight, the Missouri State Board of Education is getting ready to return power of St. Louis Public Schools to a local, elected school board. But not every goal of the state takeover has been met. But the school board kept at it, holding elections and conducting meetings. Those meetings are taking on new importance as the district is on the verge of getting back local control. They’re now held at district headquarters; the superintendent and other district leaders attend. Two new members will be elected to the board Tuesday. They’ll join just a few weeks before reinstitution of its power to oversee the education of more than 21,000 students. Current members have gone through months of intense training from the Missouri School Boards’ Association. 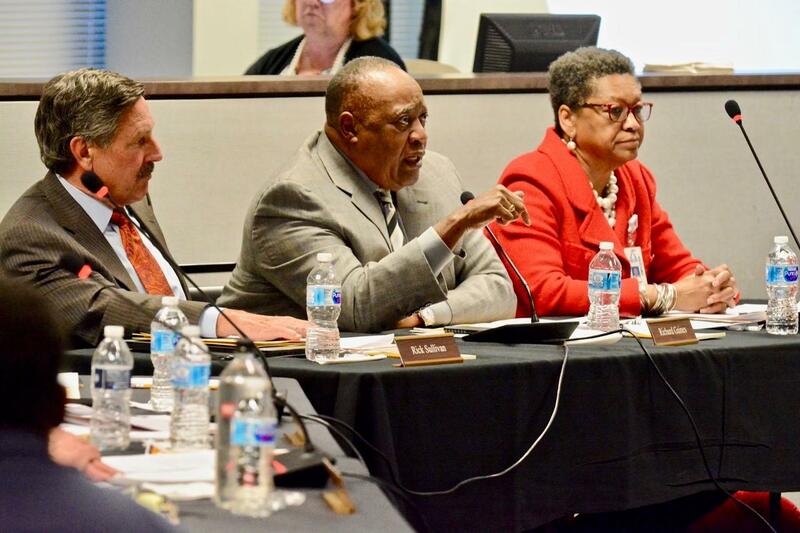 Kinks still need to be worked out as board members adjust to access to officials and documents, but it’s a far cry from the infighting and dysfunction that plagued the board before the takeover. “Those last few meetings were very scary because I was new and I really didn’t understand what I was involved in. I was fresh meat, as they so call it,” said board member Donna Jones. Jones was first elected to the board in 2006, just months before they were replaced with a three-person Special Administrative Board, or SAB. “It was really painful back in 2006 and 2007, I really shed a lot of tears, I went to sleep very upset just thinking about what was happening to the community,” Jones said. Jones said she stayed on the board through its disenfranchisement because the board still had an important role as a watchdog and advocate. She was re-elected to what she said will be her final term in November. A three-person Special Administrative Board has governed St. Louis Public Schools since 2007. Members Rick Sullivan, Richard Gaines and Darnetta Clinkscale at a meeting in March 2018. The Missouri State Board of Education elevated SLPS from provisional to full accreditation in January 2017, jumpstarting calls from the board and some city residents for democracy to return to district governance. With no clear exit plan written into the law that took the district away from the elected board in the first place, it’s a been a slow walk toward returning it. A task force was formed and public forums were held to study future governance options of the district, where residents largely called for the elected board to be reinstated. That’s despite many district parents knowing no other world than the SAB. The SAB declared its work finished in January 2018. “It seems like a much cleaner way of getting things done if I have some sort of direct control or say over who ends up leading the school district I’m in,” said George Plank, a parent of two young children at Mallinckrodt Academy of Gifted Education. There’s been increased focus on the school board elections. Seven candidates are running for two open spots in the April 2 election. They are Adam Layne, David Merideth, Louis Cross, Barbara Anderson, Bill Haas, Tracee Miller and Dan McCready. Stacey White attended a recent forum for school board candidates. She’s hopeful an elected board will mean more community involvement in the district and improved support for students with learning disabilities. “St. Louis Public Schools is wonderful. They just need to make sure they have the necessary services in place and they stay on top of these students passing and not just passing without being able to read,” said White, who is the guardian of four students with special needs. Improving academic achievement has been the most elusive part of running the district, according to Rick Sullivan, the SAB’s chairman. “Our number-one goal was every child reading at grade level, and we’ve never achieved that goal, and there’s still a lot of work to be done to accomplish that,” Sullivan said. The SAB hired Kelvin Adams to head the district in 2007 after years of leadership-team turmoil. He’s already outlasted the average urban superintendent and has agreed to a three-year contract extension. SAB meetings have become a well-oiled machine. Adams said he hopes to get there with the seven-member elected board. The state school board is expected to gather in St. Louis in late April to vote to end its control of St. Louis Public Schools. The SAB will then cede back to the elected school board on July 1. Adam Layne began “noticing a theme” after a third consecutive question about affiliations with charter schools during last night’s St. Louis school board candidate forum. Layne is running again for the school board after an unsuccessful run in November. But the former Teach For America corp member at Clyde C. Miller Career Academy is already on a board of the soon-to-open Kairos Academy charter school. Two other candidates had some ties to the independent public schools that educate about a third of St. Louis’ public school kids.